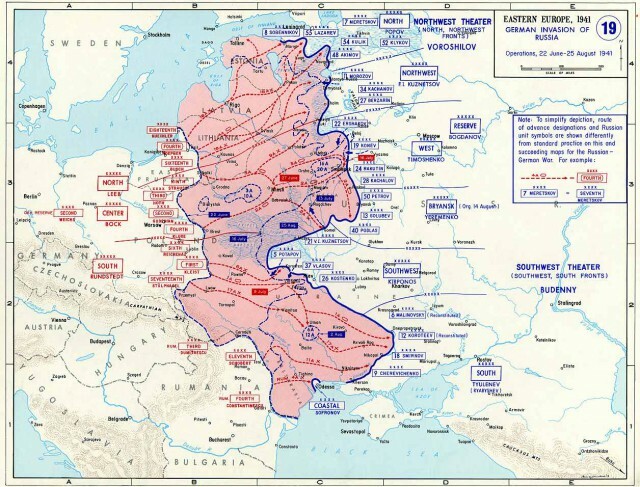 On June 22, 1941, Germany and the Axis powers commenced Operation Barbarossa, the invasion of the Soviet Union along a 2,900 km front with a force of some four million soldiers, the largest invasion force in history. In the Baltic states, Army Group North swept through the Soviet defenses in a matter of days and by early July, the Soviet army had withdrawn to the Stalin line, praying they could stop the rapid German advance to Leningrad. The Russian’s Northwestern front was a costly disaster, both in lives and equipment. But in these few days of fast devastation and retreat, there is a story of the crew in one lone Russian KV tank that held back the Kampfgruppe Raus of the 6th Panzer division for a bold and precious full day. It was a remarkable, defiant stand against the German war machine. The Battle of Raseiniai, from June 22nd to June 27th, was fought for control of strategic river crossings in Lithuania over the Neman (Nemunas) and Dubysa Rivers near the village of Raseiniai and the city of Kaunas. Well, in truth, this was a battle of the Russians trying desperately to put together any kind of effective counterattack against the Germans who had secured such river crossings by the end of the first day. This was a battle of tanks. The Germans sent in 245 tanks against the Russians 749. And it might be hard to imagine that the Germans could overcome such odds before the role of the Luftwaffe’s Luftflotte 1 is considered. Luftflotte 1’s aerial assault at the beginning of Operation Barbarossa took out a huge portion of Soviet communications as the ground troops moved in. This helped contribute to a huge lack of coordination of accurate information for the Russian forces. In one instance during the Battle of Raseiniai, Russian tanks attacked what they thought was the German flank, but was, in fact, the full front of the advancing Reich. Had it not been for Luftflotte 1, the Germans might never have overcome their greatest obstacle in the Russian Mechanized Corps: the KV-1 and KV-2, Russian heavy tanks. The German’s Panzer 35(t) didn’t have guns that could penetrate the thick armor of these Russian beasts and nor could their 37mm antitank guns. Even when the KVs were out of ammo, they sometimes just drove up and ran over the German antitank guns. When the Luftwaffe was unavailable for bomber support, 88mm anti-aircraft guns and sticky bombs placed on the tracks of the tanks were all that managed to take the Russian beasts down. The KV-1 & KV-2, which we first met here, were really something! Our companies opened fire at about 800 yards, but it remained ineffective. We moved closer and closer to the enemy, who for his part continued to approach us unconcerned. Very soon we were facing each other at 50 to 100 yards. A fantastic exchange of fire took place without any visible German success. The Russian (sic – Soviet) tanks continued to advance, and all armour-piercing shells simply bounced off them. Thus we were presently faced with the alarming situation of the Russian (sic) tanks driving through the ranks of 1st Panzer Regiment towards our own infantry and our hinterland. Our Panzer Regiment therefore about turned and rumbled back with the KV-1s and KV-2s, roughly in line with them. In the course of that operation we succeeded in immobilizing some of them with special purpose shells at very close range 30 to 60 yards. A counter attack was launched and the Russians (sic – Soviets) were thrown back. A protective front established & defensive fighting continued.